The Academy of Motion Picture Arts and Sciences has a long history of using innovative voting methods to nominate and select the winners of its annual Academy Awards. This week it announced changes in the way nominations for the sought-after Best Picture award will be determined and confirmed that it will keep ranked choice voting (RCV, or "instant runoff voting) for the final vote for Best Picture.. The Academy announced Tuesday that, beginning next year, movies will be nominated for Best Picture using a modified form of the choice voting form of proportional voting used for nominations in nearly all other categories. The new rules will always result in at least five nominated movies and as many as ten, but not a fixed number. The Academy has long used choice voting to select nominees and adopted instant runoff voting to select the Best Picture winner in 2009. FairVote confirmed with Academy leader how the new rules will work. Under the new Best Picture nomination system, Academy voters will submit ballots ranking their top 5 movies in order of preference.The job for those voters (likely to be about 5,000 out of a pool of 6,000) is easy: just indicate their preferred movies in order of preference. Best Picture nominees will be chosen according to the following process -- a more complicated one than traditional choice voting, but still making it likely that the final set of nominees will reflect a full diversity of perspectives among Academy voters. First choice votes are tallied as one vote each. If any motion picture nominee's total in first choices surpasses 11% of first choice (which is a fifth more than the 9.1% threshold -- typically in choice voting this surplus happens for any ballots beyond the victory threshold, but the Academy adds this extra "cushion"), then that nominee's "surplus" ballots above the winning threshold are distributed to next choices, with every ballot added to the totals of the next choice listed on it at an equally reduced value (with the total of those transferred values equal to the surplus beyond the victory threshold). If the second choice on the ballot has already passed the victory threshold and been nominated, then the ballot is added to the totals of the third choice, and so forth. This process is repeated for each nominee that has more than victory threshold. At this point, all pictures with less than 1% support are simultaneously eliminated. Any ballots ranking them first (or redistributed from nominated movies) are added to the totals of the next choice on the ballot that has not been nominated. As veteran entertainment journalist Steve Pond details in his highly recommended discussion of the potential impact of the new rules at The Wrap, this process will result in fewer votes actually counting for nominated movies in the final round, but will also increase the value of a movie having enthusiastic support. Very few motion pictures will be nominated that don't have close to 5% of first choices, unlike under the old rules. At the same time, it's also possible that a Best Picture nomination will go to a more iconoclastic movie that has enough strong adherents to secure 5% first choice support, but is not widely enough known or appreciated to have been able to secure 9.1% of the vote under the old rules. The rule changes will only affect nominations for Best Picture. As in previous years, choice voting will be used to select nominees in nearly all other categories, and ranked choice voting will be used to select the ultimate winner of the Best Picture award. In another notable development, the Academy also indicated that it will soon be shifting to an electronic voting system in lieu of paper ballots, possibly as early as next year. 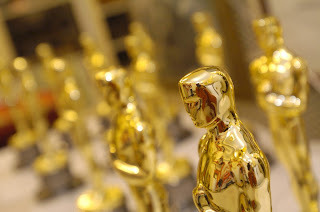 Oscar season 2011 is over. At the Academy Awards ceremony last night, The King’s Speech took home the coveted Best Picture award, besting such prominent contenders as The Social Network and Inception. Just like last year, the winner of the award was chosen using the Academy’s “preferential voting” system, otherwise known as instant runoff voting. And once again, the results refute the notion that the preferential voting system tilts the playing field in favor of any certain kind of film. In the wake of the ceremony, there has been speculation in some quarters that The King’s Speech might have been helped along to victory by the preferential balloting method. But a quick look at results from this year and last shows that this argument stands on shaky factual ground. Just as The Hurt Locker did last year, The King’s Speech won both the Best Picture award and the prize for Best Director. Unlike the Best Picture category, which was expanded to a ten-candidate preferential ballot contest last year, the Best Director category is decided by a more traditional formula: Five nominees are selected, and the winner is chosen by a simple plurality vote. If there were, as skeptics claim, a built-in advantage for certain candidates in the IRV system, then we would expect the Best Director category to produce results different from the Best Picture outcome. But in each of the first two years of preferential balloting, the results have been the same, with the Best Picture winner also taking home the Oscar for Best Director. This would suggest that, far from radically upsetting the traditional system, the introduction of IRV in the Best Picture Category has simply provided a means to protect fair outcomes while expanding the field to ten candidates. Many of those who either criticize or praise these best picture outcomes based on use of IRV are missing a key point. It’s upholding fair outcomes, not allowing winners that couldn’t win with the old plurality voting system. IRV and plurality will usually pick the same winner -- indeed, they always would if there were only two choices. When the two systems don’t pick the same candidate, IRV is fairer, as it would suggest that plurality voting would have resulted in a winner who needed a split vote to win. Much of the conjecture of IRV’s impact has been based on a lack of understanding that IRV is a one-person, one-vote system designed to elect the movie that has a lot of first choices, but also beats the other top movies when matched against them one-on-one. A movie is not going to win by being everyone’s second choice, and a movie won't win based on the order of elimination of the weakest movies. It's called an instant runoff for good reason: IRV will elect the movie that more voters prefer to its top competitor. This year’s Best Picture result was accurately predicted by the OscarVotes123 poll, in which voters were given the chance to rank all ten candidates in order of preference – just as the Academy members did on their ballots. The poll provides a round-by-round breakdown that shows which voters had their ballots counted for which candidates, providing an illustration of an instant runoff in action. OscarVotes123 plans to conduct another poll next year. In the mean time, interested readers can create their own polls at www.DemoChoice.org, a free tool for conducting IRV elections. Oscar night is barely a week away, and Academy of Motion Picture voters have had to submit their ballots. Now it’s down to the counting. For Best Picture, that count will be with instant runoff voting, the ranked choice voting method used for a growing number of elections around the world. What is striking is that the favorite for the Oscar Best Picture’s Award, “The King’s Speech” has a unique connection to IRV. On May 5, the nation where the movie takes place—the United Kingdom-- will hold its second national referendum in history. 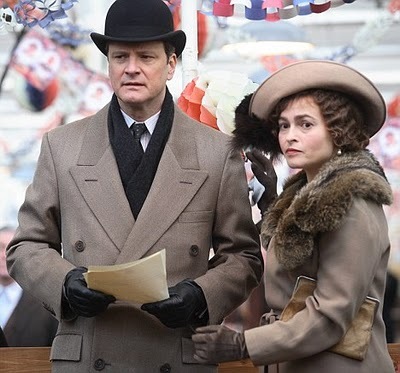 The subject matter will be on instant runoff voting – called “the Alternative Vote” in the UK -- for future elections to the House of Commons Furthermore, the movie’s leading star – Colin Firth (George VI) and Helena Bonham Carter (Queen Elizabeth) – have joined the “yes” campaign. Colin Firth, the overwhelming favorite for Best Actor declared to The Guardian: "The referendum is a once-in-a-generation opportunity to change our clapped-out politics for good. I'll be voting yes." There’s one more connection to flag. The other main actor of the movie, Geoffrey Rush (who plays King George’s speech therapist), is from Australia, where members of the House of Representatives have been elected by Instant Runoff Voting for nearly a century. Are all these signs a product of coincidence or a real touch of destiny for “The King’s Speech”? Will the voting method that Bonham Carter and Firth support for their country elect their movie as the Best Picture of the year? The answer will be given on the 27th -- and an even bigger question about the future of fair elections and voter choice-friendly electoral rules to be answered in the United Kingdom on May 5th. The New York Times has a spiffy site for their poll / voting on the Best Picture Academy Award. All ten nominees are on the ballot but there's something a little wrong - they're using a plurality ballot! Their ballot will show who has the most votes, and could reveal a majority winner - but as of this posting NYT's poll leader The King's Speech is at a 44 percent plurality. The Academy of Motion Picture Arts and Sciences uses a preferential ballot like the one offered above. Instead of a single choice, a voter ranks their favorite flicks. On our ballot, as of this posting, The King's Speech is at 33 percent of first choices. If you view the results and click on "FINAL ROUND" the film goes on to be the majority winner. What has happened is the app performed a series of runoff elections until one flick, The King's Speech crossed 50 percent + 1 of the votes. I like the New York Times and read it often. But please, the "paper of record" should at least have a preferential ballot for their mock election! If you want a more realistic Oscar election - use our app above. With ballots soon to be returned to determine the winners of the Oscars at the Academy Awards, members of the Academy may have questions about the instant runoff voting system used to select the winner of the Best Picture award. Also known as "preferential voting" in Australia, "the alternative vote" in the United Kingdom and "ranked choice voting" in some American cities, instant runoff voting has been used in the Best Picture category since 2009. Not everything Oscar analysts are saying about the system is accurate, however. Here are four key points for Academy voters to keep in mind when filling out a ranked choice ballot for Best Picture. 1. To vote, you simply rank the nominated movies in order of preference, indicating your first choice, second choice and so on. Voting is literally as easy as “1, 2, 3.’ Oscar ballots are counted according to a straightforward counting procedure that allows voters’ backup choices to be taken into account if their first choice has been defeated. To read about the details of the process, see our earlier post. 2. Voters should rank as their first choice the movie they most want to win and their second choice as their sincere next favorite. A voter should vote sincerely, starting with your first choice, onto your second choice and so on until you are indifferent about the remaining choices. Any effort to help your favorite movie by changing your order of preference is foolhardy and nearly certain to backfire. 3. Rank as many movies as you can without concern about hurting your first choice. A voter’s ballot is only counted for one movie at a time and your second choice will never count against the chances of your first choice. That’s because your vote will only count for your second-choice film if your first-choice film is eliminated from contention. Suppose you really want to see your top choice to win, but its top competitor is your sincere second choice. Ranking that competing movie as your actual second choice will not have any effect on the chances of your first choice winning – rather, it’s only potential impact is to help that second choice defeat the remaining movies. 4. Don't rank the same movie more than once. Ranking a movie multiple times (e.g. as 1st, 2nd and 3rd choice) will not help that candidate’s chances of winning. Because your backup choices only come into play once your first choice has been eliminated, repeated rankings of a movie do nothing to help that movie. Note: As discussed in this earlier post, there are two different forms of “preferential voting” used by the Academy. The other variation used to select nominations is called choice voting. It is a form of proportional representation designed to nominate potential Oscar winners who reflect the strong preferences of as many Academy voters as possible. In the days since the nominations of the 83rd Oscars’ ceremony awards were announced, the entertainment press has written quite a bit about the surprises, along with the usual talk of scandalous snubs. What should be highlighted more, we believe, is the important role of the system used to choose these nominees -- who, no matter matter happens in the final vote, are already winners. Much attention focuses on the battle for Best Picture, seen by many to be between The King’s Speech and The Social Network, two movies with very different profiles: one telling he story of a king trying to improve his speaking skills in a World War II background while the other telling the story of the more current topic of the early days of Facebook. “A surprise is not a snub. Yes, it was a surprise that Waiting for Superman wasn't on Oscar's final list of 5, but we figured a surprise was coming (we just picked the wrong one) and just because it was surprising doesn't make it a snub. As I wrote on Monday, voters were looking for a passion pick to "stand as the emblem of the exceptionally great year that we just had." Reflecting the choice voting method that doesn't allow any one faction of Academy voters to dominate the nomination process, a range of films earned one of the ten nominations for Best Picture this morning. The web is buzzing with news and analysis, with The King's Speech earning 12 nominations across the many Oscar categories, followed by True Grit with 10 nominations and The Social Network and Inception with 8. 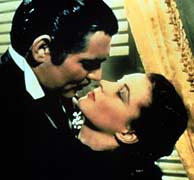 In addition to The King's Speech, The Social Network and True Grit, seven motion pictures earned nominations for Best Picture, with a mix of Hollywood blockbusters and well-reviewed independent films with relatively minor budgets: Black Swan, The Fighter, True Grit, Kids Are All Right, 127 Hours, Toy Story 3 and Winter’s Bone. As detailed in our post on the Oscar nomination voting progress, the Academy has relied on the choice voting method of proportional voting for more than a half century, realizing that it ensures a mix of nominees reflecting the full diversity of Academy voters' preferences. It must be working: the Oscar telecast is often the most watched program around the world. On Tuesday, January 25 at 8:30 am, we will learn which achievements have been nominated for each of the 2010 Academy Awards. This announcement, a precursor to the dramatic moment when the final envelopes will be torn open on the night of the ceremony, marks the end of the opening phase of Oscar season and the beginning of the home stretch. It also reflects the results of a nominating election among the 5,755 members of the academy using a proportional representation system known as choice voting or "single transferable vote." Referred to by academy officials as “preferential voting,” choice voting is designed to accommodate a large number of candidates while accurately reflecting the preferences of academy voters. It has been used to for Oscar nominations for more than six decades. The 5,500 voting members of the Academy of Motion Pictures Arts and Sciences (AMPAS) are divided into voting groups based on their professional specialty. In the nominating elections, these groups vote only for candidates within their specialty – i.e. actors vote to nominate actors, directors to nominate directors, etc. Only in the Best Picture category do all 5,755 academy members get to vote in the nominating contest. 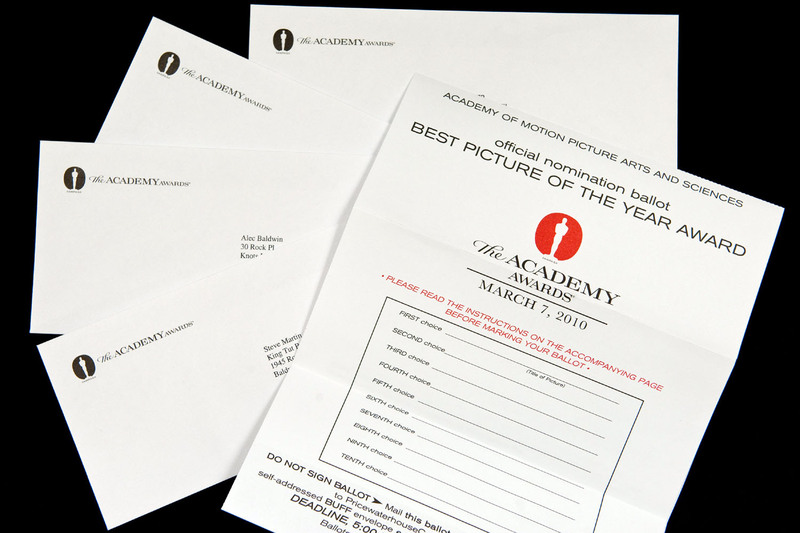 Each voter receives a ballot with five numbered slots for each category in which the voter is eligible to participate -- except in the case of Best Picture, for which 10 nominees are selected. Although each member gets only one vote, he or she is entitled to choose up to five potential nominees in order of preference (10 for Best Picture). As explained in FairVote's choice voting video, all ballots are counted to see if any candidate receives a sufficient share of 1st choice rankings to guarantee a nomination: the "victory threshold." The victory threshold is the minimum share of the vote needed to secure a nomination. With ten nominees for Best Picture, the victory threshold is 1/11th of the vote plus one additional vote (or about 9.1%). With five nominees, the victory threshold is 1/6th (or 16.7%) plus one vote. To see why this number is the victory threshold, imagine a race in which five – and only five – candidates receive exactly enough votes to garner a nomination. What is the fewest number of votes that each nominee could receive while still retaining more votes than every candidate that missed the cut? You might say 1/5th, or 20%, since there are 5 slots available. But the number can go even lower. Let’s say each of the 5 nominated films receives 1/6 of the vote plus one additional vote. This means that when we add up the total number of votes received by each of the 5 nominees, we get 5/6 of the total vote plus 5 additional votes. We notice that less than 1/6th of the vote remains to be distributed among all other candidates outside the top 5. This eliminates the possibility of any candidate outside of the top 5 receiving a share that ties any of the top 5 candidates, since any remaining candidate will necessarily have less than the 1/6 of the vote. Therefore 1/6th plus one vote is the minimum share of the vote per nominee needed to fill the top 5 in the first round, and any candidate in a category with five nominations receiving that share will automatically qualify as a nominee. - In most choice voting elections, the victory threshold remains constant, with the last winner sometimes falling short of it due to not every voter using all their potential rankings. According to Oscar analyst Steve Pond, the Academy keeps lowering the threshold after each winner to keep as many ballots in play as possible. Thus, if two actors have been nominated, and three remain, the threshold now becomes 1/4th of the remaining votes (meaning those votes not helping to nominate the first winner) plus one. This adjustment happens after each new nominee is selected. - After all surplus votes are distributed, it is still likely that not all the nomination slots will be filled. At that point, the candidate with the fewest number of votes is eliminated. All ballots ranking that candidate as a top choice are counted instead for the candidate ranked next on that ballot. - If these additional ballots push any candidates above the nomination threshold, then those candidates are selected as nominees. The process is repeated, with more candidates eliminated and their ballots redistributed until five candidates have been pushed above the number needed to advance. (For those interested in reading more about the process of selecting nominees through the eyes of an expert on Oscar voting and history, check out Steve Pond’s article from the last Oscar season at The Wrap. This week, we will know the outcome of this selection process, and speculation about the eventual winners will begin in earnest. Here at OscarVotes123.com, we will be paying close attention to the other aspect of the Oscars’ “preferential voting” system – the use of instant runoff voting to determine the winner of the Best Picture category. Stay tuned! With nominations for the 83rd Academy Awards due to be announced on Tuesday, January 25, we at OscarVotes123 welcome you back to our annual coverage of the Oscars! This blog is dedicated to examining and explaining the voting methods used by the Academy to nominate candidates and select winners. While Academy officials are famously secretive about the selection process, the methods they use are no secret and, in fact, are used in elections by governments and organizations around the world. Join us in the coming days as we pull back the curtain on Oscar voting, explaining the selection process behind the biggest awards in show business.